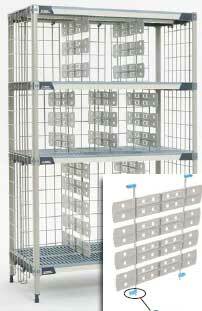 Covers standard grid shelf to create a solid shelf. Requires standard MetroMax iQ shelf. 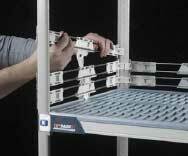 An efficient way to enclose MetroMax iQ shelving for stationary or mobile applications. Gray epoxy finish. See below for required mounting kit. Provides additional weight capacity (1,300 lbs. [590kg]) at bottom shelf location. Gray epoxy finish. Slides can be adjusted left to right to accommodate a variety of pan, tray and container sizes. Corrosion-resistant taupe epoxy finish. • Easily attaches to the shelf frame (under the mats) and is sized to hold 3", 5", 6", and 8" (76, 127, 152, 203mm) tall tote boxes. • Corrosion-resistant taupe epoxy finish. • Corrosion proof: Polymer (High-Density Polypropylene). 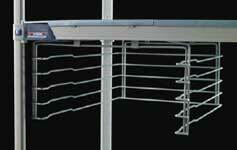 • Open four sided frames accommodate drop-in accessories including wire baskets and stainless drying racks. • Can be retrofitted to existing MetroMax iq™ shelves. 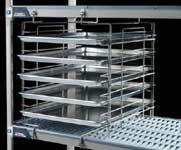 Simply remove the mats and drop in the stainless drying rack. • 1-1/8" (28mm) and 3" (76mm) slide spacing available. 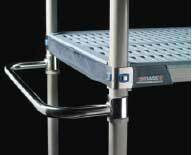 Use handles on mobile units to improve maneuvering and ergonomics. Handles will fit both MetroMax i™ and MetroMax iQ units. Stainless steel material will offer long lasting performance. 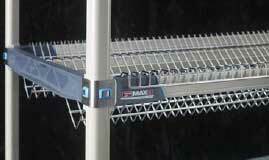 Attach easily to MetroMax iQ shelf for content identification. Plastic holders snap onto shelf edge to accommodate 1" (25mm) adhesive label (not included).